Kit design is as cyclical as mainstream fashion, if perhaps on a somewhat longer cycle. In recent years, this cycle seems to be ever decreasing with clubs having moved from releasing a new kit every few years to up to three every new season (plus the odd European edition for good measure). As the pace of change increases, so the time span between design phases shortens and as kit designers look ever more to the past for influence, so we see the period of influence change too. One period that so far seems to have been largely ignored however, is the late '80s / early '90s. This was a time that saw designers no longer shackled by the limits of fabric technology and with it a host of insane ideas were released into the kit world. As with all fits of excess, it burned itself out in a refreshers coloured flame at Euro 96 and shirts once again settled into the land of collars and traditional colour schemes. Things soon began to swing further in the retro direction and the logical conclusion was reached with the ultra minimalist Tailored By Umbro range. But as is the way with design, once a point has been reached, the only way to go to be fresh is in the opposite direction and a few kits in recent years have hinted that perhaps it is time for the retro backlash to begin and maybe we'll begin to see a return to some of the more interesting ideas from the time. 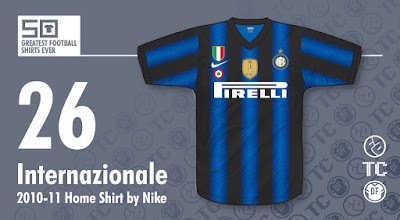 At first glance, this seems like just another standard Inter shirt. The requisite black and blue stripes, Pirelli sponsor, classic V neck, etc... But something isn't quite right and there’s something familiar about it, but I just can’t quite work out what. Then from a childhood memory, I see images of Peter Shilton picking the ball out of the net... a lot. 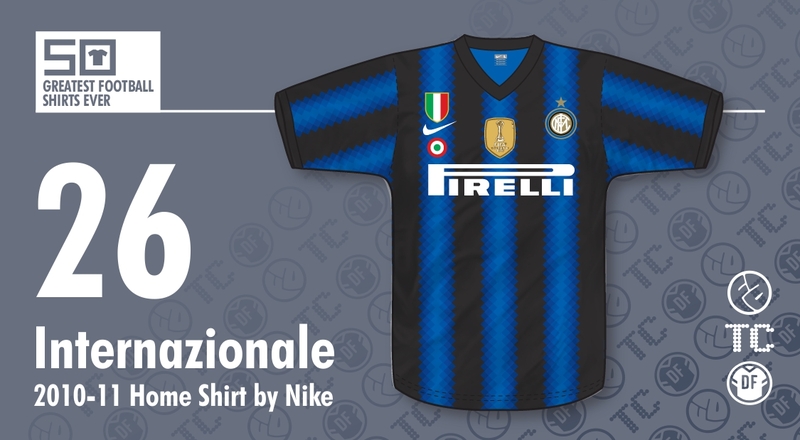 And there it is: Inter's 2010-11 home shirt was a re-imagined version of England’s goalie kit from Euro 88. And I for one was happy with this. For too long kits have been taking themselves too seriously. When this shirt was released, I had hoped it was heralding a new dawn in kit design and that perhaps we may once again experience some of the insanity those E filled days had brought. As with England at Euro 88, however, this was most certainly the falsest of dawns and the only real 'eccentric' design that followed was Warrior's Space Invaders / Horace Goes Skiing efforts with Liverpool. Looking back, the design wasn't as one-dimensional, so easy to label as it first appeared. Yes, the stripes are clearly influenced by late '80s experimentation, but the overall look and feel of the shirt is actually one of clean lines and simplicity. There’s no unnecessary trim, the sleeve design doesn't vary from that of the main body, the sponsor’s logo is bold and clear and the V-neck is an understated wrap-over in plain black. Stepping back and considering the shirt as a whole, it’s actually a great piece of design; A classic shirt that’s undeniably Inter, but with a hint of something else; an assertion that maybe some of those garish kits weren't actually all that bad and that it might well be time to reintegrate some of those ideas back into the world of kit design to create a new hybrid. Post modern, modernist cool. Written by Rich Johnson (The Football Attic).